Let’s talk about a popular retention mechanic: Energy. That’s right. Energy is a retention mechanic. It can be used to monetize (and do social stuff), but it’s primarily a retention tool. Let’s define energy mechanics, just so we’re on the same page. Energy is a time-renewable resource consumed when players initiate a game’s core gameplay loops. It’s a rough definition and needs work, but it suits most of our discussion purposes. I’ll break this down a little further, to make it clearer. Energy is a resource consumed when players initiate a game’s primary gameplay loops. A game’s core gameplay loop is what people would consider to be the broad actions of playing a game. Planting crops, solving puzzles, launching missions, investigating crime scenes, etc. When a player initiates this, the energy is consumed. 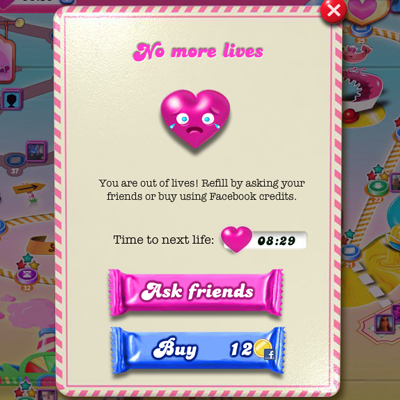 Variations do exist, although they are still tied in concept; in Candy Crush Saga, your energy resource (“lives”) are only consumed if you do not successfully complete a puzzle. However, viewed from another angle, one could say that lives are consumed for attempting the puzzle, and your reward for beating it is to have your life refunded. In any case, should a player exhaust all of their energy, they are unable to initiate the game’s core play loops. They may be able to do other things with the game, but these actions are usually limited to acquiring consumable resources. They cannot gain experience or see new content. The actions that cost energy and the actions that don’t cost energy aren’t decided arbitrarily. This is very deliberate. 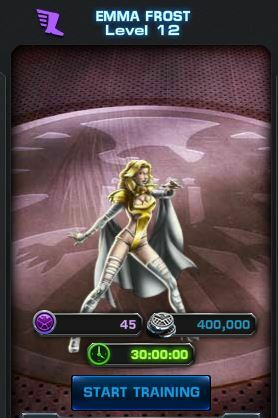 Note how it costs SHIELD points, silver, and time to train Emma, but it does not take energy. Like I mentioned earlier, energy is a retention mechanic. Let’s think about what would happen if players didn’t have energy. They would start a game, and if they liked it, they’d just keep playing and playing. Eventually, they’d hit a point where they were done with all the content in the game. No more quests, no more puzzles, no more reason to keep playing. That’s when they quit. Even if you do have enough content, they can play until they burn themselves out and quit. That’s bad news for a game. A game needs money to live, and players aren’t usually willing to pay money until they’ve been playing for a while. The game needs player to come back every single day, building up a presence in that player’s life, being a constant source of fun and generating a feeling of good will. That’s when a player might decide it’s time to return the favor and give some money to the game. That’s why energy can run out, but energy doesn’t just bottom out at zero. 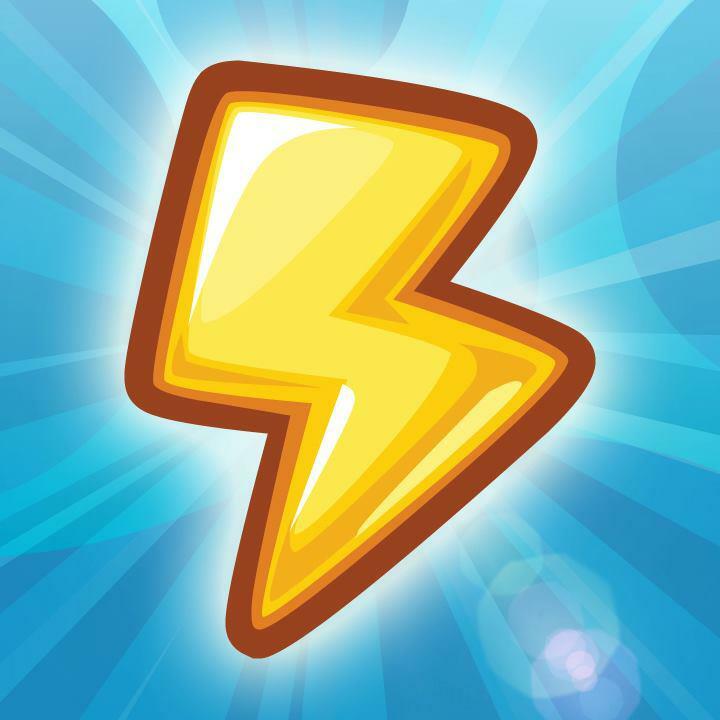 Energy has a cap; from casual observation, usually five iterations of the core play loop if it isn’t an invest/express game like Farmville, but in general, you get a play time of 15 to 30 minutes out of a full energy bar. I’ll save the talk about the specific numbers for a future talk, but the point is that energy can top out, and time that you spend with a full energy bar is energy that you’re losing by not having enough space in your bar to hold it. That triggers something called loss aversion. People don’t like losing things, and while a player might not literally be losing something here, they’re losing out on gaining energy, and that encourages people to check back throughout the day, see how they’re doing, and burn off some energy. This is something called an appointment mechanic. Appointment mechanics include things like rest XP in World of Warcraft, but it’s something I’ll talk more about later. Combined, those two are the main point of the energy system. Slow a player down so they don’t see all of a game’s content too quickly. Provide an incentive for them to play the game regularly. It’s both simple and effective. That said, energy can also be used for monetization and acquisition. Many games will allow players to spend money to buy energy. Used carefully, this can generate a lot of money, but you need to be careful of making sure players can’t just burn through all your content. On the other hand, if priced so a player spends more than the expected lifetime value burning through the content, maybe this might work out for you. The fact that practically every game will sell energy for money suggests that it usually works out for the best. Energy is also used in many games as a social mechanic. You can ask your friends to give energy (or rather, click on a button that causes you to gain energy. They don’t actually lose any of their own). You can give energy to your friends. You can invite friends and get energy for it. You can visit your friends and collect energy. There are lots of ways this can work out, but it all boils down to players asking their friends to sign up and incentivizing them to play the game after they’ve signed up. This results in organic acquisitions, better retention, and an actual community of players who will talk to each other about your game. The player is being asked to wait, ask friends, or spend gold for additional lives. It’s easy to see energy as primarily being a monetization mechanic, since players usually only see it as a popup that asks them for money, but its power as a retention tool really can’t be overstated. It’s simple and effective, and it’s no wonder that so many games use it. So you got someone to play your game. Congratulations! If you’re running a free to play game, though, your job’s just begun. You need to keep them coming back as often as possible. You want this new player to become a regular player. How do you get them to come back every day? Free stuff! Everyone loves free stuff! In Candy Crush Saga, there’s a wheel in the lower-left corner. It spins and does whatever it can to catch your attention. If you give in to your curiosity and click on it, you get a much bigger wheel that you can click on. It spins and spins until the little clicker thing stops on a space, and you get that prize. 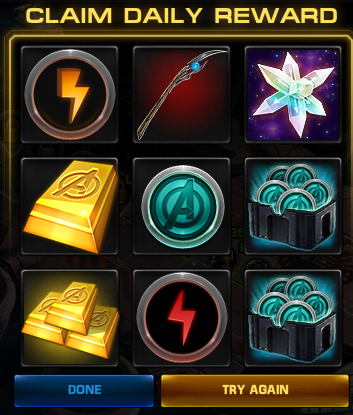 Marvel: Avengers Alliance has a random daily reward as well. A space is highlighted and it rotates quickly through all the different prizes until it slots down and stops on one of them. This isn’t limited to social or mobile games, either. Look at Warframe. Rewards: The player gets a goody. Players love that. 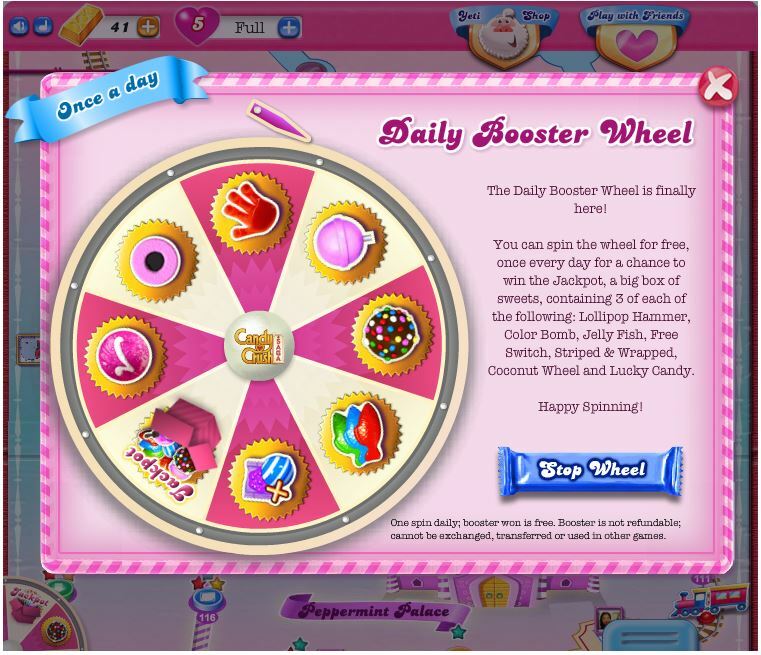 Login: The player has to log into the game to get their tasty prize. It isn’t something that just builds up in their game account until they come to claim it. Daily: This is the really important part. The whole reason this exists is to get users to come back every day. This cool prize is just waiting for players to collect them, and players can’t just log in every few days and collect a backlog of prizes from last week. They need to be in the game every single day. If they don’t show up, they don’t get anything! Random: This is the part that really fascinates me. You have a daily login reward already. Why have a random element? The job’s done, isn’t it? Technically, yes, but it’s the random element that really makes the random daily login reward (I’m just going to call it RDLR, not because that’s a real industry term, but because I’m getting tired of typing it.) so effective. If you look at that Candy Crush image, you’ll see a big box labeled “Jackpot”. One of the spaces in the Marvel: Avengers Alliance image has Loki’s staff, just like in the movie! These RDLRs aren’t just prizes: They’re a VARIETY of prizes. They can be energy, or some premium currency, or a time-limited goody, but there’s always one prize that the players really want. In many of these games, the RDLR that players end up getting is usually a minor expendable resource, but there’s always the chance of getting something incredibly valuable. If the user skips a day, they aren’t just giving up a free energy refill. They’re giving up the chance to get that big prize! The games make a big show of the random element, as well. A big wheel spins. A light cycles through the options. There are ticks and beeps and other noises that slow down and build suspense. The player might almost get that big prize, only for a last-moment shift that settles on a different reward. Those “near-misses” are carefully-engineered. Like modern slot machines, there aren’t any physics involved. They generate a random number, likely in the thousands or hundreds of thousands, and have that mapped to a prize. They play an animation to make it settle on the pre-determined prize, and the ticker slowing down near the jackpot is an intentional tool to raise suspense. It reminds the players that those big prizes exist, and that maybe tomorrow, they’ll be luckier. The daily login reward might seem minor, but it’s a small moment of excitement, right when you start the game. It’s an experience! It’s four to five seconds of fun! It sets the mood for the entire rest of the play session, and it gets the user thinking about coming back tomorrow. PS: Look at that “Try Again” button on the Avengers Alliance screenshot. They figured out how to monetize the RDLR! Brilliant! Addendum: After attending tonight’s SV IGDA meeting, it was brought to my attention that it need not be random at all. It only needs the appearance of randomness. For example, a player who hasn’t logged into the game in a while might log in, and to encourage them to stay with the game, they might be presented with the highly-desirable item. If you want players to keep playing your game, it needs to be fun. It has to be something they want to play. This sounds obvious, and it is, but it’s impossible to stress this enough. People play games to be entertained. Never lose sight of this. People want to have fun. People like to do things they think are fun. I could talk for the rest of my life about the nature of fun and never come close to really describing it, and since I intend to update as often as I can, I want to leave some stuff for later. For now, I’ll just cover it in broad terms. The traditional video game approach to fun is by presenting challenges for the players to overcome. If a challenge is too difficult, the player becomes frustrated. If a challenge is too easy, the player becomes bored. A player’s skill at playing the game rises with continued play, so the game needs to present challenges of increasing difficulty to keep players from getting bored. If a game’s difficult rises with player competence at a 1:1 ratio, players might still become bored because the experience is too similar whenever they play. A game needs challenging parts and easy parts to shake things up a bit, and what’s challenging or easy is relative to a player’s skill. When a player faces challenges that grow to their skill level and present easy parts to let them exercise their mastery, and hard parts to present them with memorable challenges to overcome, that’s where engagement and fun happens. This is by no means the only method of having fun, but it’s a baseline common to many games.